The Predator 3500 Watt Super Quiet Inverter Generator gives you the confidence to enjoy the outdoors in comfort. Likewise, it can be a reliable companion for work on things such as welders, or in emergency situations. For your outdoor recreational needs, the Predator 3500 Watt Super Quiet Inverter Generator is the perfect choice when you need to power your RV on long road trips. No doubt, everyone on a camping trip would welcome its company, as it can provide a few critical modern conveniences like a fresh pot of coffee. Needless to say, everybody will be thankful for the chance to charge their phone even in the middle of the wilderness. Best of all, nobody would be afraid of the dark all thanks to its lighting support. 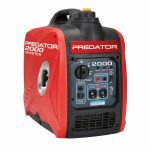 The Predator 3500 Watt Super Quiet Inverter Generator also means business. 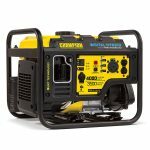 This portable generator can help you take on various tasks at home or at work. So you can be certain to get the job done even if you have to work overtime to finish it. You can also count on it in the event of a disaster. Indeed, you can depend on the Predator 3500 Watt Super Quiet Inverter Generator for your recreational or work requirements every time. Portable – This inverter generator is meant to travel. It weighs in at a little over 99 lbs. Rest assured you don’t have to carry it wherever you go. The Predator 3500 Watt Super Quiet Inverter Generator comes equipped with its own set of casters for smooth rolling anywhere. 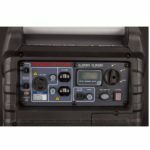 Quiet – As its name suggests, this inverter generator is very silent. It has a sound rating of 57 dB (decibels). So you rest easy none of your neighbors will complain about its noise even if you end up working into the night in your backyard. Versatile – The beauty of this particular inverter generator is it can perform nearly anywhere you plan to use it. It can go camping with you. Likewise, take it along with you on a tailgate party so the festivities can go on for hours after nightfall. Would you believe you can even take it sailing with you and it can power up whatever you have on board. Powerful – The particular inverter generator delivers a maximum starting wattage of 3500 watts. It generates 6 HP (Horsepower). So you can be sure you have enough power to get things done. 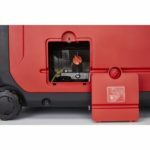 Its connections include a dc-12v two Pin outlet, a 120V AC twist lock outlet, plus 2 120V AC grounded outlets for your convenience. Efficient – The inverter generator has a 212cc air-cooled OHV gas engine. It carries unleaded gasoline. It has a runtime of 11 hours at 25% capacity. Even at 50% load in its tank, it can still run for a good 9 hours. The generator shuts down on its own when the oil is low. Easy to use – Its electric starter makes it easy for you to get it going. No fuss and less hassle for even a woman to use. Safe – The inverter is equipped with an electric overload protection. So you don’t have to worry about your safety and of those within its proximity while it is turned on. Power surges – This inverter generator might be too powerful. In some cases, power surges seem to happen even when it is supplying a small load or sometimes none at all. Wheels – While it does have wheels for portability, the size of its casters are quite small and might be in issue if you plan to take it outdoors where the terrain is not so forgiving. 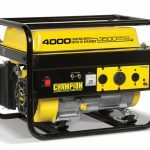 What’s missing – Certain features are missing from the Predator 3500 Watt Super Quiet Inverter Generator and these could make a big difference in its practical application. For instance, you cannot start it by remote and it has no gas gauge. Needs coverage – If you plan to use it outdoors in the rain then make sure to put a roof over it so it does not get wet. Limited – Bear in mind not to attach too many appliances or gadgets to the inverter generator all at one time. Otherwise, it will not have enough power to run everything at the same time. 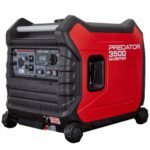 The Predator 3500 Watt Super Quiet Inverter Generator promises to surpass your expectations. It can handle all your power needs. At the same time, it will not make so much noise while it is working even regardless of how much load you connect to it. 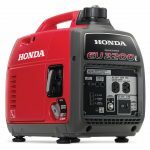 This generator is also easy to use and even your wife can start it up for you while you are busy setting up the rest of the camp site. 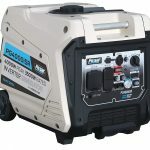 Moreover, you will no doubt be the envy of everyone else around you when their generators start to make a lot of noise. They will even more jealous when they find out how much it costs.